Sony Pellissery and Sylvia I. Bergh: Paper to be presented at the 2006 International Conference of Human Development and Capability Association, Groningen, Netherlands, 29 August- 1 September 2006. Rajan K. Sampath: World Development, Vol.20. No.7, pp. 967-977, 1992, Pergamon Press Ltd.
Second Interim Report on Technical Assistance to Malaysia in Irrigation and Drainage Legislation, October 1995, FAO. Proceedings of Seminar, 14-16 August 1995, Negeri Sembilan, Malaysia. 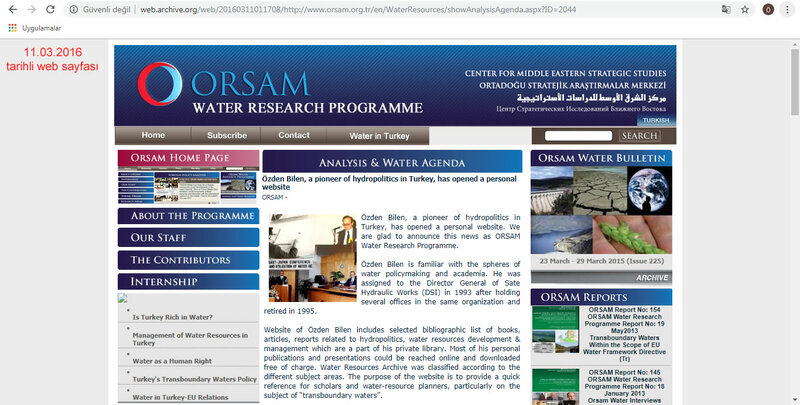 Report on Water Resources Policy by B.G. Appelgren Water Resources Policy Consultant: UN FAO, Rome, October 1994. Devlet Su İşleri Genel Müdürlüğü tarafından hazırlanmış ancak yasalaşmamıştır.